Two very different creatures learn about the give-and-take of friendship in these warm and funny stories set in the desert. Snake is elegant and calm, and a little self-centred; Lizard is exuberant and irrepressible. 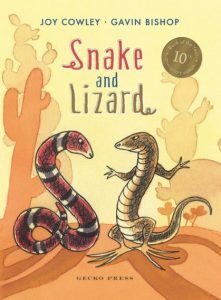 With its wisdom, acceptance and good humour, Snake and Lizard captures the essence of friendship. The stories are beautifully illustrated by Gavin Bishop in the warm and clear colours of the desert. “Snake and Lizard are ‘The Odd Couple’ of the reptile world. Listen to – and watch! – one of the stories of Snake and Lizard here.